Wombatking.com has again added more scans of the original storyboards from Transformers The Movie. As a bonus, he has added scans of some pages that were not included on Sony BMG’s Transformers The Movie DVD. New York, New York, August 29, 2006 � In celebration of the November 7th release of TRANSFORMERS The Movie 20th Anniversary Special Edition DVD, the home entertainment group of SONY BMG Music Entertainment today revealed the results of the recent fan voting for the favorite quote from the classic animated film. 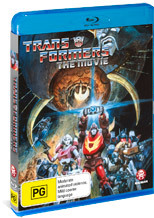 Over the last seven days, fans logged on to www.TRANSFORMERSthemovieDVD.com and voted for their favorite quote from TRANSFORMERS The Movie. Fans were able to choose between nine memorable quotes from the classic animated feature film. After an overwhelming response, a winner has been crowned. A clip of the favorite quote will be posted today on www.TRANSFORMERSthemovieDVD.com. SONY BMG has commissioned fan-favorite TRANSFORMERS artist Don Figueroa to create the imagery for a special �transforming� DVD cover. One piece of cover art features Optimus Prime appropriately situated in a position of prominence. Joining the Autobot leader are Megatron, Bumblebee, Starscream, Blaster and more of the most popular TRANSFORMERS characters. In the second image, Hot Rod � as he transforms into Rodimus Prime � is grasping the Matrix of Leadership as it lights the Autobots� darkest hour. Above, Unicron begins to destruct, while Galvatron, Arcee and Springer look on.